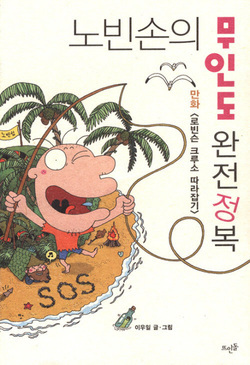 Domestic science book series that explains how to survive on a deserted island, Amazon jungle, Bermuda Sea, and Antarctica in an interesting way! Experience a 99.9% real-life adventure while reading about everyday science facts and knowledge. *Click the cover image for another PDF! 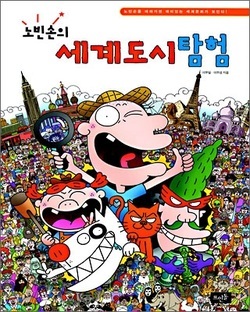 In this series, Nobinson goes to Egypt, China, Italy, Japan, U.S.A., England, Spain, France, Germany, Russia, Turkey, and India! 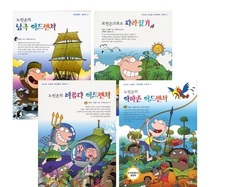 From ancient Egypt to modern-day China, this series allows children to learn about important events happened in human history and cultural backgrounds of various countries. After reading this series, children will be able to appreciate that each and every person contributes to a bigger cause. From Mesozoic Age of 250 million years ago to the outer space and a technologically advanced nation, Popsicle Rebuplic, Nobinson's journey continues! 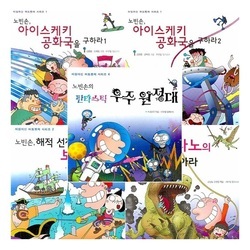 2 most favorite and popular titles of Nobinson Series have been translated and published in English! 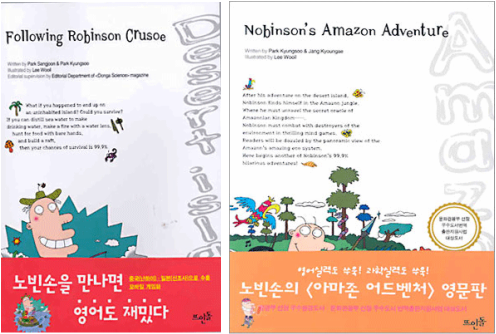 These are the translations of first two books from Nobinson Series and set to be more available for children around the world to be dazzled by Nobinson, just like children who had privilege to meet him first! It is a thrilling game of chase and hide-and-seek between the mysterious Count of Mask and Nobinson! Readers travel through the representative cities of each country in the world as they accompany Nobinson and his crew and the Count of Mask to find the hidden treasure. There are lots to see in a city-architectures that prominently show the characteristics of that country's culture, people representing traditions and customs. 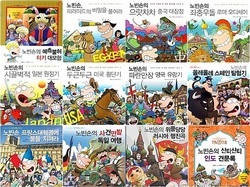 After these long adventures through the cities, there is a section full of vivid photos and fun illustrations that will enable readers to see the characteristics of each country more accurately in a single glance. 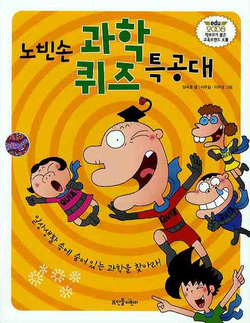 In this series, Nobinson goes on to the Mars Expedition to solve Mars Mystery, solves the weather anomalies, and becomes Nobinson-man, a superhero! Can Nobinson save his life and will everything be back to normal at the end of the day? Read on to find out! *Click the cover image for PDF! People who were lingering for more of "Following Robinson Crusoe", people who are worried they might one day end up on a deserted island, people who despise science and think the science they learned in school is useless, people who think cartoons are childish and cheesy, and people who need hope and courage- read this book! A book that combines fun and scientific facts! Can you survive on a deserted island? 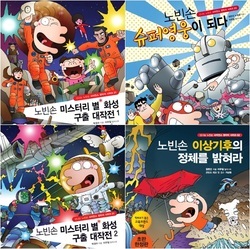 This book helps readers become familiar to science with fun quizzes about the science hidden in parts of everyday life. Once you solve all the quiz questions after avoiding the science quiz squad's trick answers and completing noisy lessons on science concepts, the science quiz squad's secret notebook is revealed. In the notebook are textbook information related to the science of everyday life, enabling readers to understand what they learn in school. Plus, various science facts are provided so that they can expand their scientific knowledge.